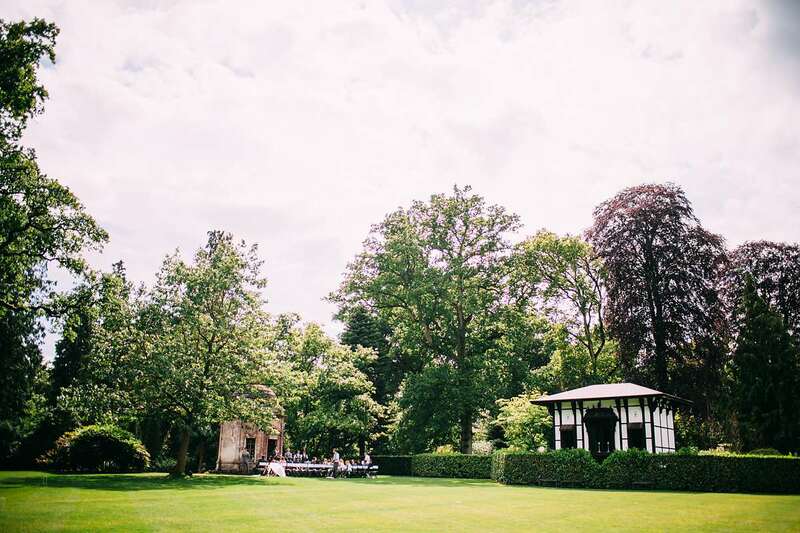 Levi and Trevor’s Larmer Tree Gardens wedding was spectacular. I was a little worried about their plans for an outdoor humanist ceremony. Lets face it, June has been a poor month for weather so far! With drizzle in the morning the skies only cleared when Levi arrived for the wedding ceremony. I don’t describe many wedding venues as being enigmatic but Larmer Tree Gardens really has something special about it. I can’t quite put my finger on it. Maybe it’s the amazing architecture, the beautiful surrounding country or maybe the peacocks. It’s really a peaceful, carefree and a happy place to be. Being a Larmer Tree Gardens wedding photographer is a dream job. I was so happy to be able to capture the story of their wedding day. There was so much emotion and their friends from London were a really fun crowd. Levi wore the most beautiful custom made dress from Jo Irvine Designs. And, if you’re curious, Trevor’s suit was from Primani! They collected wild flowers from a market in London and arranged them themselves on the day. As well as baking ginger bread people and decorating them for the favours. Levi was so fun to be around, she literally didn’t stop smiling all day. Even during the rain in the morning she wore a smile and didn’t let the gloomy looking clouds spoil her mood. Trevor offered to carry my heavy camera bag on several occasions and even offered me a celebratory whiskey in the morning (which I declined!) It was quite the international turnout for the wedding with friends and family coming from all over the world and Trevor’s family from South Africa. Lots of their friends and family baked and bought wedding cakes for a competition which was a nice personal touch. As well as tasting pretty amazing with an afternoon tea. One of my favourite anecdotes from Trevor was that he showed all of his friends the wedding photos. A lot of them asked ‘dude, why are you holding umbrellas before the ceremony, it’s sunny?’ Ah… the magic of photography! Truth was that it was raining a little and it was pretty touch and go as to whether they could have an outdoor wedding ceremony at Larmer Tree. 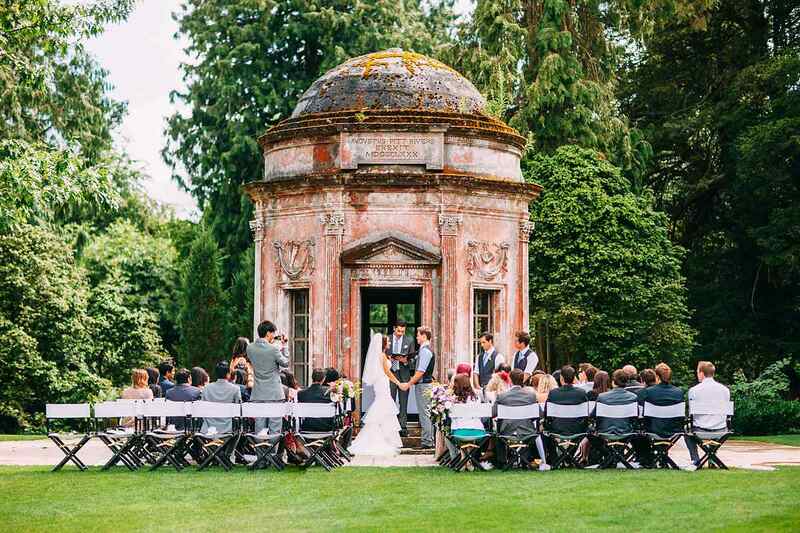 Larmer Tree has it’s own little micro climate and it’s tricky to predict what will happen for the beautiful outdoor wedding ceremony. A huge thank you for having me along and making me feel so welcome – I wish you as much fun and happiness for the future as I saw on your wedding day. If you’re looking for a Larmer Tree Gardens wedding photographer then please do get in touch. Wow, this day is gorgeous. Love everything. The exit shot of them from the ceremony with petals flying everywhere.. what a moment! So many winners here. I really felt as though I was part of the wedding. The getting ready photos really shine! Great work. Congrats to the lovely couple. Some of the best journalistic photos and natural portraits I’ve seen in a while. Awesome. Superb quality! And what a dang good-lookin’ couple. Love the photos of Trevor getting ready – he’s a hottie! That venue is awesome!! Nice! Love the tones. The portraits in the field are beautiful. Great coverage too – there are so many great photographs! Yeah Albert. You’re killing it these days. FOR SURE. great work dude, that couple’s got some swag. what a sick venue. looks like you had some really hard lighting, but handled it well! Superb and beautiful work. I love every shot. What a great wedding and I love their style! One of my favourites from you. That’s likely to change though as it does with each wedding. Holy crap these are amazing. Love the venue. Excellent story-telling! Great wedding and great images. Nuff said. What a beautiful couple and such a cool place to get married. The ones in the field are just gorgeous! Great work, absolutely nailed it again. Love the shots of the bride with her veil – beautiful. Wow. This is just amazing – the location, how you included it in the story of the wedding, the energy, everything. Great moments Albert! Just like watching a movie! What Joseph said, just magical! Really brilliant photos of special and gorgeous wedding. I could not be there to share the day with Trev and Levi so it was so nice to loose myself in the beautiful pictures. I love ther shoes! and the shot of them in the field, great work! Wow! What a beautiful wedding and a beautiful venue!! I love all the moments and details you’ve captured. Loving the shots of the couple on the stage. Also the shots of the couple in the field are brilliant. Well done. What a beautiful setting and truly beautiful images to remember the day by. fantastic!! So beautiful. I love every single photo. You did a great job capturing their special moments here, it really comes across as a wonderful day. Seriously beautiful shots Bert – I love the ones in the wheat field – simple and stunning! Trev, absolutely stunning!! Wish we could have been there. Wow! That was a fairytale wedding! Awesome pics! Beautiful images and the day looks fantastic. The shot of the guy with his feet on the bed is genius! Amazing pictures! I like the story telling style as if you are reliving it. Very good job! So many stunning pictures. lovely detailed wedding. Some trademark BP field shots too! Is it just me or is EVERYONE at this wedding really, really, really ridiculously good-looking? Albert these are all gorgeous! amazing wedding! cheers from mexico. Gorgeous. I adore the ones in the field. The whole wedding location was amazing. I love how you worked the DoF with the bridal party and bride coming down the aisle. Gorgeous work! Every time I visit your blog, I must pin something to pinterest for future inspiration. Today is no exception. What an amazing set of images… beautiful setting… words cant really describe how stunning those photos are. The bride and groom must be very happy with those! Really nice Bert, do I spot some into the light portraits? What a stunning wedding and a beautiful couple! Really love your work! Stunning images. The field had such great lighting that you captured. Stunning photographs truley profesional and heart felt. Well done!!! Holy cow, these are gorrrrgeous! that little chapel is AMAZING!!!!! beautiful set, i’m sure your couple is thrilled!! Gorgeous images! What an absolutely stunning bride! I adore her dress and veil. Beautiful stuff Bert. The shot of the Levi lifting her veil is just perfection and the portraits in the field are stunning.